Oz Turners manufacture and supply a range of Australian built contractor quality Hydraulic powered flail mulcher attachments for excavators and Skid Steer loaders designed to safely cut and mulch lantana, blackberry, small trees, grass and scrub. Designed to be attached to an excavator, skid steer or a backhoe, these units are designed to effectively cut and mulch heavy vegetation with standard or high flow hydraulics without the need for aftermarket cooling. 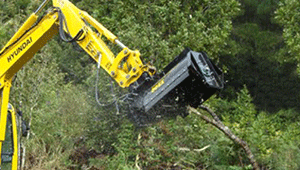 OZ-50EX has a 1250mm wide cut and is suitable for 12+ ton excavators. As with all Oz Turner attachments, ease of use, longevity and durability are of the highest priority which is why we use double wall construction, 13mm thick cutter drum, 18mm blade ears and oversize sealed bearings standard features. These Excavator Flail Mulchers use direct drive 90hp hydraulic motors for superior power delivery with poly mount to reduce vibration instead of using clumsy belts and pulleys. With 3 flails per mounting weighing 1kg each the EX series mulcher is an excellent choice for tree pruning or brush and grass cutting near populated areas. The cut debris is directed downward and not outward while rubber side guards also help to stop any excess being thrown outwards.